Tom was born and raised in southern Arizona and he and his wife, Rose, live in his grandmother’s original adobe house on the family ranch. Although the ranch no longer has forest permits to raise cattle, Rose still has a couple of horses. 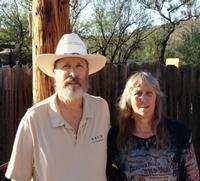 Tom and Rose have raised three sons – two of them live in Arizona and the other resides in Pennsylvania. Tom and Rose are also proud grandparents to a granddaughter and two grandsons. As many of you may know, Tom has worked in a supervisory role in the housing construction field for most of his working career. Tom’s mother and his brother also live on the family ranch. During a routine physical, it was discovered that Tom had hepatitis C which in turn had caused cirrhosis of the liver. Tom underwent 11 months of chemotherapy with interferon, after which he was told that his only chance at a healthy life would be to have a liver transplant. Even with insurance, Tom will have many uninsured transplant-related expenses such as: co-pays and deductibles, doctor visits, travel to and from the transplant center and the costly immunosuppressant medications that he will need to take for the rest of his life. To help with this financial burden, a fundraising campaign in Tom’s honor has been established with HelpHOPELive, a nonprofit organization that has been assisting the transplant community for 30 years. All donations are tax-deductible, are held by HelpHOPELive in the Southwest Liver Transplant Fund, and are administered by HelpHOPELive for transplant-related expenses only. Your contribution is greatly appreciated.For more information, please contact HelpHOPELive at 800.642.8399. Tom, Our thoughts and prayers are with you. The donation is also memory of your mom. I second Edith Lowell, my friend in saying Hang in there! Love you brother looking forward to our many long rides together for many years to come. The only true and consistant friends to me for many-many years. Cowbelles across the state are pulling for you, Tom. We will work to help you through this process. Rose and Tom, we are so pleased to know that help is available. Your friends at Nogales/River be on your team.